White Tigers are amongst some of the rarest animals in the world, with it being estimated that there are only around 100-200 globally both in the wild and in captivity! 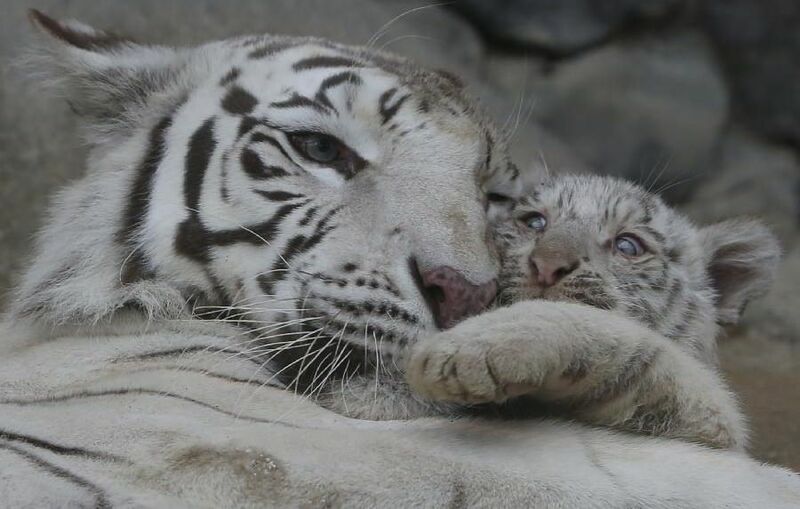 With such a small population there has been a huge hype from The Tobu Zoo in Saitama located in North-West Japan, as they announced the introduction of four tiny white tiger cubs that had just been born! In the video, we can see the tiny four sleeping and bonding with their Mother as they had only been born hours earlier. They have all confirmed a healthy weight and look super adorably cute! The cubs are believed to be a descendant from the Bengal Tiger but with a pigmentation variation which is what gives them the striking white fur look and bright eyes. However, this pigmentation is what is extremely rare and, therefore, means numbers are very low. Additionally, due to their striking looks and being so stunning, they are top of poachers list to hunt for their fur. Once more, survival in the wild for these white tigers is more of a challenge than the Bengal tiger as their bright white fur does not blend in with their natural surroundings, meaning sneaking up on prey proves a larger challenge. In Japan, there are a known 30 captive white tigers in healthy zoos but these four are bumping up the figures which are great to keep these beautiful species from becoming extinct. The cubs ate currently separated from their father whilst they grow stronger and complete their weaning period from their mother. The Tobu Zoo said they have a lot of precautions and experts in place to ensure that the cubs are healthy and grow up to be big and strong in order to protect species. The white tiger could be arguably one of the most beautiful animals in the world and judging by these four adorable cubs mother, they will most definitely grow up to be absolutely breathtakingly beautiful. What makes this story extra special is that there was only expected to be one or two cubs being born, just like humans, tigers don’t bare more than one or two children whilst pregnant but this mother had four baby cubs! Previous article12 Freaky Animals You Wont Believe Are Real – No Not Photoshopped! What you say and how you look in the yearbook is how you'll be remembered by many, so it's no surprise that a lot of students choose to make theirs humorous. Here are 12 of the most hilarious yearbook quotes that have ever been written.